Today was a great day. We left for the Great Wall- a newly opened section- not the one Nixon visited. The Clintons have been to this section. We went there b/c it is less crowded. It’s about 1 1/2 hours from Beijing, and when we left the smog was hot and stifling. About 45 minutes into the drive it started to rain very heavily and we were pretty glum, knowing this was our once in a life time trip to the Great Wall and we were afraid we would see nothing and get soaked. By the time we arrived, it had stopped raining, it was clearing and there was a cool breeze blowing in from the Mongol side. 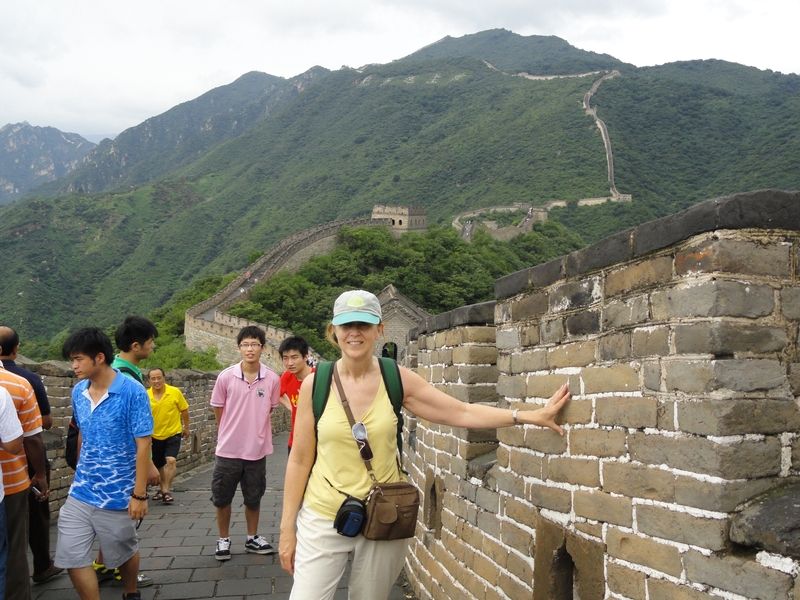 It was fantastic- the mountain peaks to the north, the valleys and farms to the south, the views of the wall snaking over mountains as far as we could see and the randomly crooked, worn, and precipitous steps- and we were ON THE GREAT WALL! We listened to a expert on the Great Wall yesterday who is soon to have a book published on the Great Wall- David Spindler. He gave us a lot of interesting history and pointers, like to look for the contrast between the more yellow bricks, laid down during the Ming dynasty, and the bricks dating from the most recent repairs.